It really is something that just won’t die. 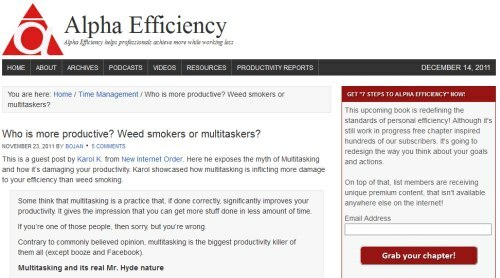 Seems like every day there’s someone who thinks they’re good at multitasking … they aren’t. No one is. I admit, this is an easy trap to fall into. It sounds perfectly reasonable. Why wouldn’t you be able to do many things at the same time, right? This is what I was thinking some time ago, before I realized that multitasking is KILLING my productivity. What’s your opinion? Do you agree?